If you had to pinpoint one defining characteristic of haunted attractions, it would be change, as in the need to change things up to keep an attraction fresh year after year. Many haunts entertain repeat customers and the only way to consistently keep them coming back is to provide fresh scares. How can that best be accomplished? If you’ve got the time and the budget, a full redesign can deliver the goods, but sometimes a few scene changes are all that’s needed to keep customers on edge and screaming for more. 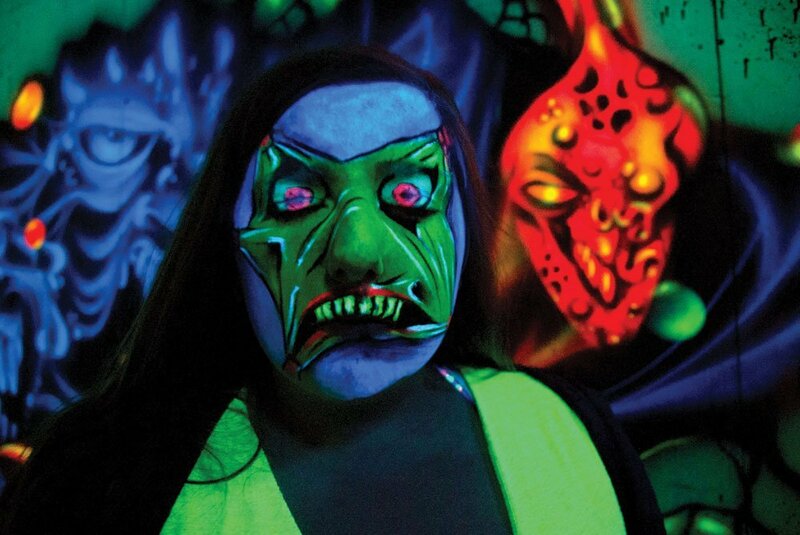 At Fright Kingdom in Nashua, N.H., Owner Tim Dunne takes his design cues from popular culture. “We follow the trends of what people are following on television shows regarding anything related to horror,” he said. “And right now, what’s hot is the walking dead [zombies].” This upcoming Halloween season Fright Kingdom will unveil a Survivor’s Camp. The setting will be a government military facility that has been abandoned and taken over by civilian survivors. A lot of surplus military equipment will be incorporated and actors will be sporting military fatigues. Many of the sets and scenes will be painted the ubiquitous olive drab flat military color. 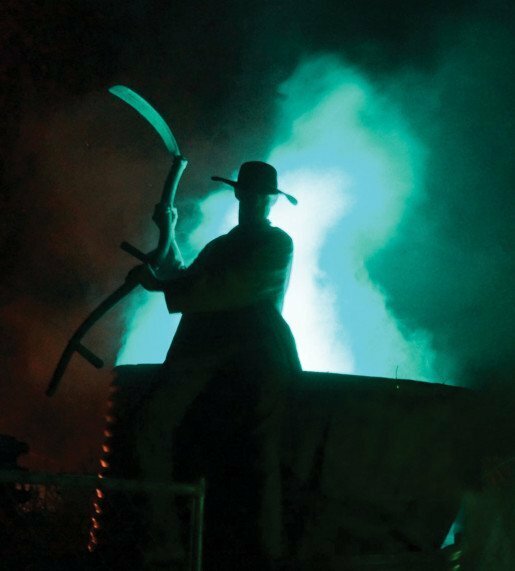 At Spookyworld Presents Nightmare New England, a new Haunted Hayride addition is a mile-long scare occupying 17 recently purchased acres. Spookyworld Presents Nightmare New England in Litchfield, N.H., spent over $1.6 million on an expansion last year. After its 2014 run, the venerable New Orleans-based House of Shock Haunted House almost decided to call it quits. However, a major show of support from the local community plus fresh investment breathed new life into the haunted attraction and it returned for a 23rd season. Appropriately enough, House of Shock called its 2015 show “The Resurrection.” It featured two brand new terror-inducing events that will see further development and refinement heading into the 2016 season. “The story line behind House of Shock is we always push the envelope. We’ve always been ahead of the curve as far as what horror is going to be. We were kind of the groundbreakers to make haunted house go extreme,” said Ross Karpelman, co-founder and creative director. An actor at Dead North. The Butcher Brothers Slaughterhouse is a popular stop along the attraction’s haunted trail. Efforts will center around their new Haunted Hayride addition, a mile long scare fest occupying 17 recently purchased acres adjacent to the park’s location along the banks of the Merrimack River. They purchased 10 tractors and 10 wagons that can conceivably carry up to 400 patrons at one time along the trail. “We really put a lot of energy into building 10 different themes throughout the hayride. Each scene is entirely different so patrons never know what they’re going to come upon or turn around a corner and find,” said Caulfield. For instance, there’s a plane crash scene that incorporates pyrotechnics. There’s a mutant village complete with a mad scientist and creatures that are half animal and half human. One of Caufield’s particular favorites is a camping scene that features over 1,000 spiders. “In 2016, our goal is to refine our Haunted Hayride and provide additional training to our actors,” Caulfield said. A mask from Dead North in North Danville, Vt. The haunt features 15 buildings along a mile-long trail. 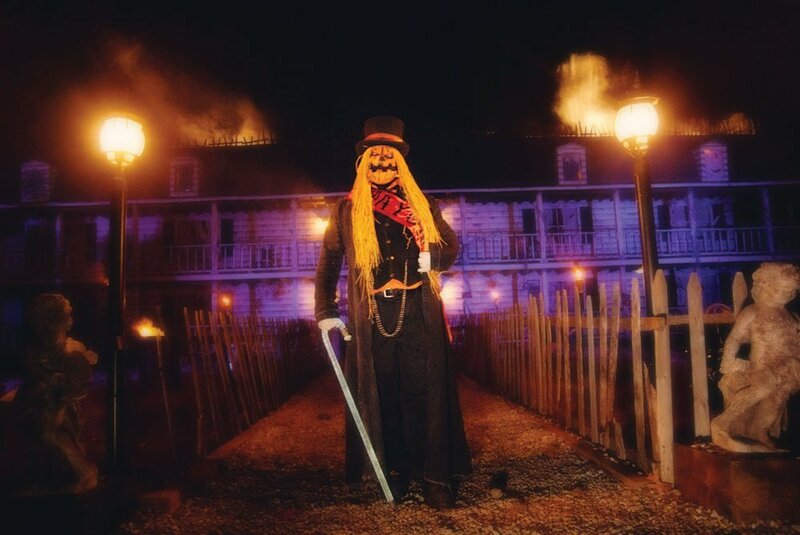 “Haunted houses are probably the most Yankee of endeavors. 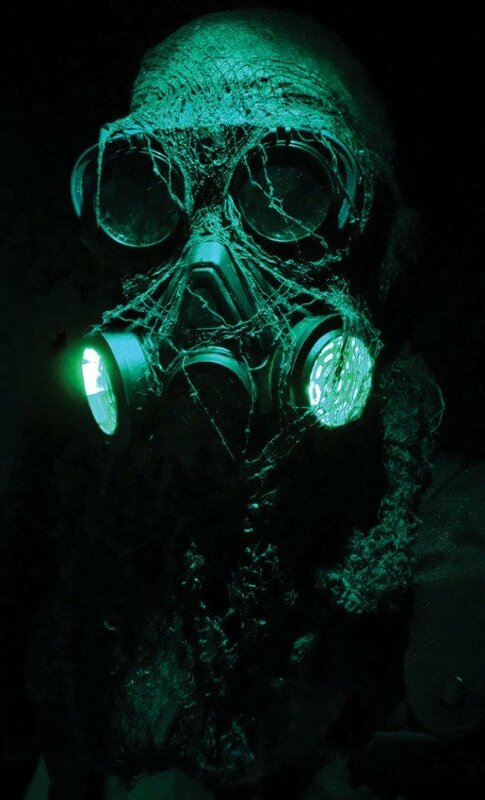 Yankee meaning using what you got and reusing and reusing it,” said Mike Boudreau, owner of the haunted attraction known as Dead North in North Danville, Vt. 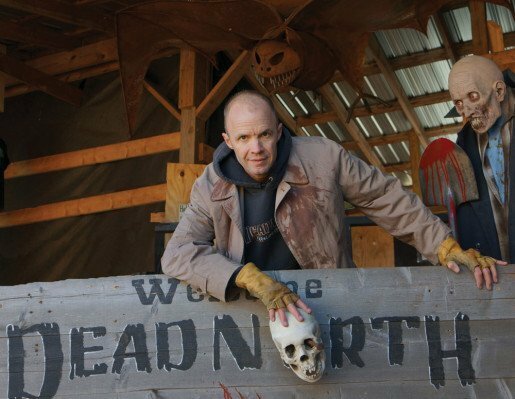 Located at the Great Vermont Corn Maze, Dead North involves a corn field but it is definitely not a maze. It features approximately 15 buildings along a mile long trail each presenting a unique scare factor. The Butcher Brothers Slaughterhouse has always been a popular stop along the trail for instance, and last year Dead North added a greenhouse. It featured dying plants and all kinds of emerging creatures. In 2016, this ever-resourceful Vermont haunted attraction plans on augmenting an existing church cemetery scene. Dead North is very much a family and community affair. “We actually have 20 families that scare together and my own kids have been scaring practically their entire life,” Boudreau said. An entire group of young girls want to help out this year so the plan is for them to haunt the church scene. “First there will be dead silence and then a large gaggle of girls wearing torn, old dresses, bedraggled-looking hair and white faces will come at you from different corners like the living dead. Very ‘Children of the Corn,’ ” said Boudreau. It’s just one more example of good old Yankee ingenuity meshing with an essential tenet of the haunted attraction industry – namely, you’ve got to keep it fresh.